Attraction Marketing + LeadsLeap Advertising = ? You probably have come across the term of Attraction Marketing. It is the strategy that almost ALL successful IM gurus and network marketers use. The basic principle of Attraction Marketing is to ‘teach’ instead of to ‘sell’. You position yourself as someone who knows the subject well and share your experience (note, it’s experience, not just general info) with the audience. Once the audience trust you, they will be open to take up whatever that you recommendation. How long does it take for someone to trust you? The good news is, with internet, all it takes is one good solid article! Imagine landing on a 3000-word article detailing how to rank #1 in Google, with step-by-step action plan that you can follow. If you are interested in SEO, what will you do? Bookmark the page? Join the mailing list? Buy the tools that are recommended in the article? What about an article that shows you 5 traffic generation systems that the author has tested? 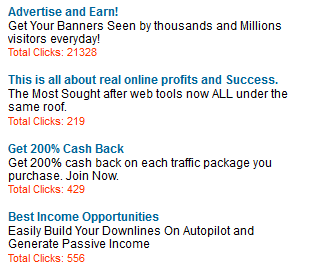 Will you be keen to try out the best traffic system that has worked for him? As I said earlier, Attraction Marketing is the strategy that almost all, if not all, successful IM gurus and network marketers are using. If you are still hoping to find another holy grail, stop wasting your time. At this point, you may be wondering, what has all these got to do with LeadsLeap advertising? You see, providing good values to your visitors is one thing. Getting traffic to SEE what you offer is another thing! Metaphorically, you can be the best cook in the world but how do you tell the world that you are if they don’t even step into your restaurant? Take a look at the ad unit below. It is how our ad unit looks like now. Notice the ‘gift’ and ‘graduation cap’ icon next to the ad title? These icons tell the audience that the content of the ad is either a gift or an educational content that they can get for free. 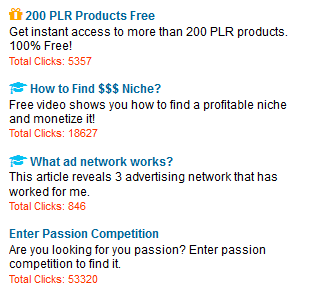 Can you see the linkage between Attraction Marketing and LeadsLeap advertising now? We are helping you to ‘presell’ what is on your landing page! This means the traffic that comes to your landing page is now expected to see a gift or an educational content, as compared to seeing just another ad. How to add the ‘gift’ or ‘graduation cap’ icon to your ad? Adding one such icon is really easy. Below is the new ad editing interface. The default ad type is ‘Standard’, which has no icon shown. 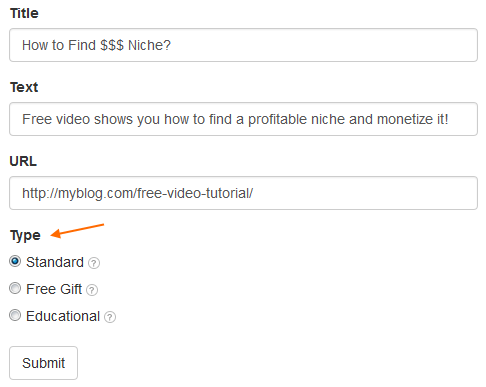 You can change the ad type to ‘Free Gift’ or ‘Educational’, provided that your landing page meets the requirement. It must REALLY giveaway a free gift or it is an educational content. What if I abuse the system? We have added a Compliance Score to the system. Each member begins with a score of 5. If you are caught abusing the system, intentionally or unintentionally, your score will be reduced. Members with Compliance Score 4 and below will need their ad to be reviewed before being shown in the network. For the rest, if what you are doing now is working, keep it that way. But soon, we will be launching a multi-ad system, where you can post multiple ads. You can then try out a different approach and see if it converts better. By the way, we’ve also added a Note feature in your ad set up page (special thanks to Bernard who gave us the suggestion). You can now write down your thoughts while managing the campaign. That’s all for today’s update. Look forward to more exciting development in the next few weeks because we are nearly done on a couple of other upgrades. Quick question. Is a typical squeeze page leading to a free report considered a gift, education or neither? For gift, you can add an opt-in requirement. But for education, it must be available on the landing page without opt-in requirement. I really like this new feature as it prompts me to really think about about my target audience and clarify for myself, what is the primary goal for each of my products and service adverts. I love this idea I will have to do this next time I do an ad. Please keep posting like this.. Thanks bunch. You know you are simply tact inspire. Thanks for the share. I really like that idea, writing a one or two great articles in your niche and you could really crush it :-), all the best ! How can i change my current ad running to another one? As the net site below shows a picture of a honeycomb, the idea of attraction promotion is to show people the resistible side of a product & attract people to take a look. I totally agree with you that Attraction marketing is a strategy that almost all the successful network marketers use. I appreciate you for letting us understand more about Attraction marketing. That’s a great help for the marketers and those students who are enrolled in marketing and promotion, it is really hard to build your reputation in the market and to define it in depth. Great program.Many features from Leadsleap help to grow my business.